This BROWN poly tarp is made with durable material and has superior strength. It was created for long lasting use and is lightweight and easy to handle. 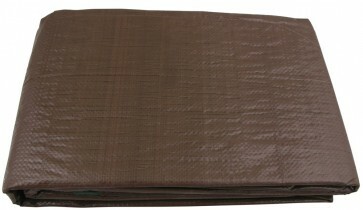 The material is water and tear resistant, which makes this poly tarp a most ideal product for any sort of job. Its multi purpose use makes it ideal for camping, construction, agricultural needs, boating, landscaping, roof covering, and much more. The tarp’s headed rope by the seams guarantees the greatest optimal strength.